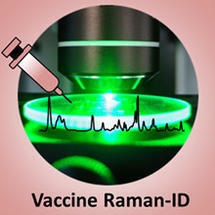 The Raman spectroscopic signature contains information of all the components in the vaccine and can be used for quick identification using machine learning. Vaccines are complex biomedicines composed of a number of different molecules. In the manufacturing process and before marketing authorisation, extensive research is required to verify the identity, quality, efficacy and safety of the products. Fast, cost-effective yet reliable analytical methods are necessary and can contribute to fighting against counterfeit medicines. Researchers from the Paul-Ehrlich-Institut (PEI) have shown with scientists from Jena that Raman spectroscopy is a suitable tool for this.